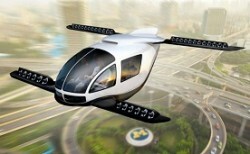 12 Apr 19 - Futuristic electric flying taxis like those seen in the movie Blade Runner could offer a more sustainable - and much faster - way to travel long distances. 3 Apr 19 - In a symbolic first, electric cars outsold fossil fuel-powered ones in Norway last month. 29 Mar 19 - The ‘Dieselgate’ scandal was suppressed for years – while we should have been driving electric cars. 22 Mar 19 - Waste from plants and trees could soon be fueling jet planes. 15 Mar 19 - As more gigantic cruise ships take to the high seas in the coming years, the industry says it intends to embrace low-carbon technologies and reduce its environmental impact. 12 Mar 19 - After years when Detroit was Ground Zero for scepticism about electric vehicles, the traditional auto industry’s hometown has become a hub of EV action. 7 Mar 19 - None of the world’s top 20 stock-listed air carriers has any plans in place to manage greenhouse gas emissions after 2025, according to a new report. 25 Feb 19 - The International Maritime Organisation inched forward last week on its promises to ban the use of heavy fuel oil in the Arctic and reduce black carbon emissions from ships. 21 Feb 19 - Applications for the latest round of Government funding for low-carbon transport projects are open. 25 Jan 19 - Boeing says its flying car prototype hovered briefly in the air during an inaugural test flight, part of the race to change the face of the aerospace industry within the next decade. 25 Jan 19 - Luxembourg's recent announcement that all public transport in the country will be free from next year was received with astonishment. 11 Dec 18 - German auto giant Volkswagen is embarking on an electric spurt, pressing ahead with plans aimed at producing more than a million electric cars a year by 2025. 10 Dec 18 - Airlines are failing to take up the most efficient planes in sufficient numbers to make a significant dent in their carbon dioxide emissions, says a new study. 7 Dec 18 - The world's biggest shipping company, Maersk, wants to slash its carbon emissions to zero by developing a new kind of container ship to ply the oceans. 27 Nov 18 - The captain of a cruise ship found to be burning fuel with excessive sulphur levels has been fined €100,000 ($NZ166,000) in a Marseille court, the first such ruling in France. 14 Nov 18 - As the price of renewable energy drops and storage technologies mature, hydrogen fuel is drawing fresh attention. 9 Nov 18 - Air New Zealand is preparing the way to operate hybrid planes on its domestic regional routes.